On Wednesday 8th March 2017, the In Her Shoes project launched our groundbreaking new performance to challenge hate crime against women at City of Glasgow College. A second performance followed at Glasgow Kelvin College on Friday 17th March 2017. Coinciding with International Women’s Day 2017, the performances, titled No-one who harms me will go unpunished. I am a woman. 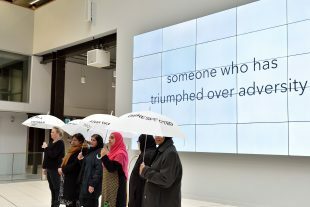 are choreographed protests; a brand new resource to raise awareness of women’s experiences of hate crime in Scotland. The In Her Shoes project worked in partnership with City of Glasgow College and Glasgow Kelvin College to give 200 students the opportunity to attend the performance and a workshop to explore their awareness, perceptions and experiences of hate crime and to discuss safe methods of bystander intervention and third party reporting of hate crime and behaviours. Since the beginning of the In her Shoes project, women have told us that hate crime against them is different because the abuse is paired with misogyny. A disabled woman, for example, may experience hostility against both her gender and disability at the same time during an incident. This performance is an innovative example of engaging women in making art that advocates for social justice. 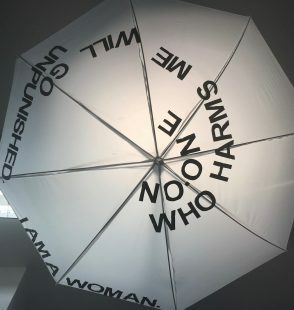 The work is important because it speaks about both women’s experiences of hate crime, and their agency in challenging prejudice by demanding change. The piece was named by one of the project’s participants, and is based on Scotland’s national motto, nemo me impune lacessit (‘no-one who harms me will go unpunished’). This was apt given women’s experiences of hate crime and the legal duty on Scotland’s criminal justice system to protect them. The performance provided an opportunity to raise awareness, and acted as a starting point for future discussion and action. In Her Shoes is one of the 22 projects funded by the Scottish Government’s Tackling Sectarianism and Hate Behaviours Programme. 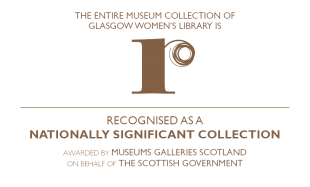 The project has worked in partnership with Amina, Scottish Refugee Council, Glasgow Disability Alliance and LGBT groups to ensure that those experiencing prejudice, discrimination and hatred are at the centre of interventions to prevent such behaviour. You can watch the subtitled audio of the performance here.